Managing many network devices can be a pain. Especially if you need to simply plug a device in and repeat the steps to configure your the device. 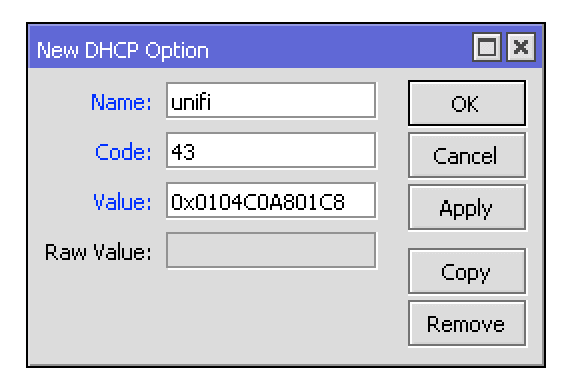 Thankfully, Ubiquiti’s controllers can be autmatically discovered and joined to Unifi using DHCP Option 43. In this article, we’ll go through configuring a Mikrotik Router that is running Routerboard 3.x (my version that I am using at this time of the article). After you have your controller up and running, you will want to sign into your Mikrotik router. For simplicity sake, I am using Winbox (available on Windows [see download at bottom of this page] or Mac OS X). Once logged in, on the left sidebar go to “IP > DHCP Server”. At the top, you will find a tab called “Options”. Click the “+” sign to create a new option. Don’t screw this step up because it is kind of confusing. Take your static IP address (for my example, I am going to use 192.168.1.200) and convert it to hexadecimal format using the IP to Hex Converter tool. We need to take our result (in my case 0xC0A801C8) and add 0104 after the x in the hexdecimal result that was created for us on the IP to Hex Converter tool. 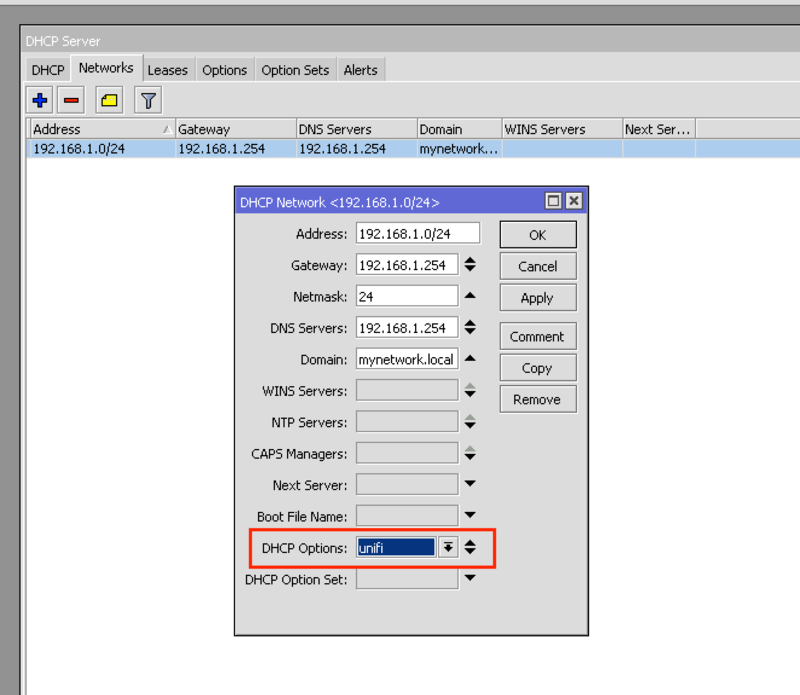 Under “IP > DHCP Server” then under the “Networks” tab, you will see a list of all your available DHCP networks. Double click on your network and assign it the unifi option that we just created. Now all you need to do is plug in your factory default device and connect it to your network. If you have a device that belonged to a different network or controller, reset the device first. When your device is booted and connected to your network, open up your controller. You should see a new device that is awaiting adoption. Click “Adopt” and all your network settings will be applied to that device. This method has saved me countless hours of going on site and makes device upgrades painless. It’s so easy, even my grandmother can do this (literally). All you need to do from this point forward is have the device on and plugged into the network and you can manage it anywhere in the world. If you found this article helpful or if you have any questions, drop a comment below!